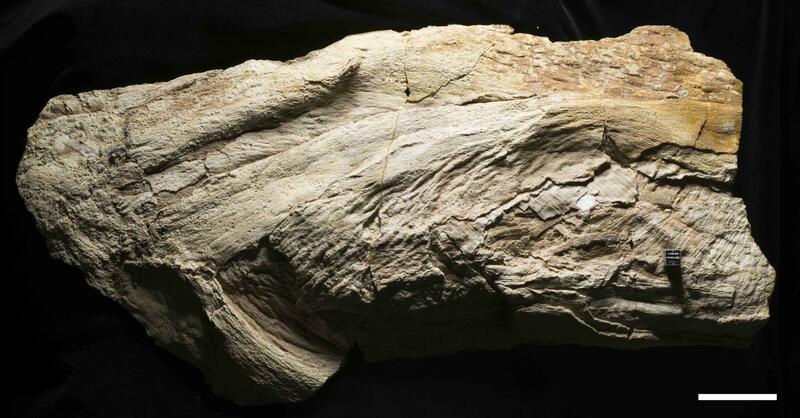 A fossil slab discovered in Kansas 70 years ago and twice misidentified–first as a green alga and then as a cephalopod–has been reinterpreted as the preserved remains of a large cartilaginous fish, the group that includes sharks and rays. In a study published in the Journal of Paleontology, American Museum of Natural History researchers describe the fishy characteristics of the animal, which lived between 70-85 million years ago. "There are many examples of temporarily misplaced taxa in paleontological history, including ferns that were once thought to be sponges and lungfish teeth thought to be fungi," said the lead author, Allison Bronson, a comparative biology Ph.D.-degree student in the Museum's Richard Gilder Graduate School. "In this case, the misidentification didn't happen because of a lack of technology at the time–scientists familiar with cartilage structure could easily see this was a chondrichthyan fish. The researchers used reasonable arguments for their interpretations, but didn't look outside of their own fields." The enigmatic specimen, Platylithophycus cretaceum, is roughly 1.5-feet long by 10-inches wide and from the Niobrara Formation in Kansas. The Niobrara Formation is one of the most diverse fish-fossil sites in North America, preserving late Cretaceous animals that lived in and around the Western Interior Seaway, a broad expanse of water that split North America into two land masses. In 1948, two paleobotanists from the Colorado School of Mines and Princeton University compared the texture of the fossil slab with that of green algae. They described two parts of a plant: surfaces covered with hexagonal plates, which they called "fronds," and supposedly calcium carbonate-covered thread-like filaments. In 1968, two researchers from Fort Hays Kansas State College studying cephalopods from the Niobrara Formation compared the specimen with a cuttlefish, based primarily on its textural similarities to a cuttlebone–the unique internal shell of cuttlefish. The reclassification made Platylithophycus the oldest sepiid squid then on record. In both of these earlier studies, the hard tissue was assumed to be composed of calcium carbonate, but no tests were performed. For the new study, Bronson and co-author John Maisey, a curator in the Museum's Division of Paleontology, applied a small amount of dilute organic acid to the specimen–a method that has been widely used in paleontology since the time of the initial description of Platylithophycus. If there is a reaction, the fossilized material is likely made from calcium carbonate. But if there is no reaction, which was the case when Bronson and Maisey performed the test, it is likely made from calcium phosphate, as are the fossilized skeletons of cartilaginous fish like sharks and rays. The most obvious clue that Platylithophycus was a cartilaginous fish are the hexagonal plates on the surface of the specimen. After taking a closer look with a scanning electron microscope, Bronson and Maisey reinterpreted that feature as tessellated calcified cartilage, found on both extinct and living sharks and rays. The new study suggests that the "filaments" earlier described are actually part of the gill arches, made up of tessellated cartilage. Gill arches are cartilaginous curved bars along the pharynx, or throat, that support the gills of fish. The "fronds" are reinterpreted as gill rakers, finger-like projections that extend from the gill arches and help with feeding. "We think this was a rather large cartilaginous fish, possibly related to living filter-feeding rays such as Manta and Mobula," Maisey said. "This potentially expands the range of diversity in the Niobrara fauna." But because this fossil only preserves the animal's gills and no additional identifying features like teeth, it cannot be given a new name or reunited with an existing species. So until then, this fish will still carry the name of a plant. The American Museum of Natural History, founded in 1869, is one of the world's preeminent scientific, educational, and cultural institutions. The Museum encompasses 45 permanent exhibition halls, including those in the Rose Center for Earth and Space and the Hayden Planetarium, as well as galleries for temporary exhibitions. It is home to the Theodore Roosevelt Memorial, New York State's official memorial to its 33rd governor and the nation's 26th president, and a tribute to Roosevelt's enduring legacy of conservation. The Museum's five active research divisions and three cross-disciplinary centers support approximately 200 scientists, whose work draws on a world-class permanent collection of more than 34 million specimens and artifacts, as well as specialized collections for frozen tissue and genomic and astrophysical data, and one of the largest natural history libraries in the world. Through its Richard Gilder Graduate School, it is the only American museum authorized to grant the Ph.D. degree. Beginning in 2015, the Richard Gilder Graduate School also began granting the Master of Arts in Teaching (MAT) degree, the only such freestanding museum program. Annual visitation has grown to approximately 5 million, and the Museum's exhibitions and Space Shows are seen by millions more in venues on six continents. The Museum's website, mobile apps, and MOOCs (massive open online courses) extend its scientific research and collections, exhibitions, and educational programs to additional audiences around the globe. Visit amnh.org for more information. Become a fan of the Museum on Facebook at facebook.com/naturalhistory, follow us on Twitter at @AMNH, on Instagram at @AMNH, and on Tumblr at amnhnyc.